When I saw this quote pop up on my Facebook news feed, I knew that I had to share it with you all. The quote speaks to where I am at this moment and time in my life. 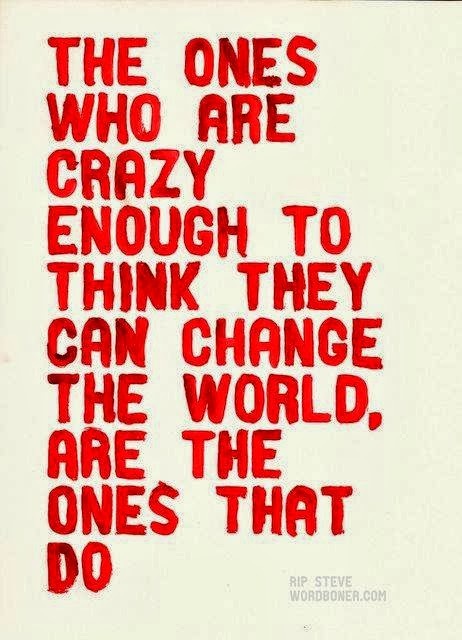 Am I crazy enough to change the world? Reflections are really life lessons over the past thirty days of life teaching you something greater than what you can ever imagine. Can I apply what I am passionate about in life and inspire the world around me to be and do better? These life lessons I have learned this month are really about creating the life I want to live and really do what my gut is telling me. Sometimes I never feel ready to start my journey, then a job opportunity that shows me what's its like to live in that dream and then my career goal shifts based on experience and is more refined. I know I will be an entrepreneur. Its just the matter of timing and then I watch a video by Alex Ikonn on Learning as you go and then I change my mind and adjust the goal plans. Dr Phil said something that struck me when he was featured on Oprah's life class discussing his book, Lifecode, he said, "The difference between a dream and a goal is a timeline." This is so true. Everything has to have a date and time frame of reaching a particular goal. It also involves a strategy, the pomodoro technique is a great way to break down the big picture goals into small tasks and helps you focus on one task at a time. In my efforts to prepare myself to change the world, I am also reading Scott Belsky's Making Ideas Happen. All I can say is that it's life changing. Being a blogger, you are always being inspired by other bloggers and authors as something I aspire to be. In Meg Biram's blog post, "10 ways to get out of your freelance rut" I was also inspired to take action and really work toward the goal of becoming the stylist I am always talking about, its about faking it until you become it. I learned all about this through a TED talk my sister emailed and told me to watch. Just more and more reasons why I should just work on the goals to get me where I want and need to be in order to be living my full happy joyful life. Marie Forleo is also inspiring me to live dreams with her inspiring videos on Youtube and her guests that constantly change the way I think about my life and the business I will soon have. The Fascinate and the Viral Marketing Interview videos are truly a must see. September has been all about learning and growing and preparing myself to become the person I want to be both inside and out. I can't wait to see what life lessons I learn in October.